Astronomical Clock – It´s hard to overestimate the significance or the complexity of this 15th-century masterpiece of clockwork and archtecture. Not only does it tell the time, but it tracks the movement of the moon and planets and the length of the days in various seasons. The part you´ll be most interested in is the procession of the Apostles every hour on the hour beginning at 9:00am until 11:00pm. Along with this spectacle, the skeleton will ring the death bell while the other figures along side him do their thing alls. It´s all over when the roster crows and the bell strikes the hour. Tyn Church – Begun in the 14th century, this imposing Gothic structure brings to mind Hogwarts or some other fairytale-like edifice. 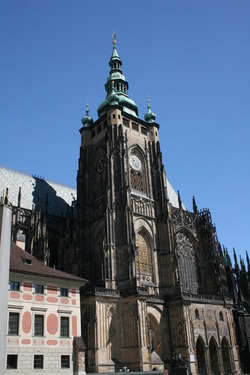 The High Gothic spires of this church are pretty much unique to Prague. And another interesting fact about this church is the fact that astronomer Tycho Brahe is buried there. Jan Hus Memorial - Erected in 1915 to commemorate the 500th anniversary of the Protestant reformer's death by burning at the stake, this Art Nouveau statue by Ladislav Saloun is also a popular meeting point in the center of the square. 3. Powder Tower - This 15th-century Gothic tower gets its name from the fact that gun powder used to be stored here. It also marks the entrance to Prague's Old Town from the east. 4. Municipal House - One of the finest examples of Art Nouveau architecture in the world, the Municipal House (Obecni Dum) is a Prague landmark. 5. Old-New Synagogue - The significance of this structure is hard to be overstated. Built in the 13th century, this Gothic synagogue is the oldest continually functioning synagogue in Europe. 6. 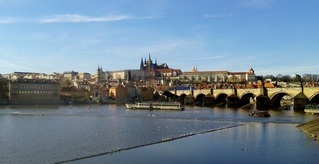 Charles Bridge - Architect Peter Parler built this Gothic bridge for King Charles IV in the 14th century. It is now one of the oldest and most beautiful bridges in Europe. 7. Prague Castle – This part of Prague is like a little city unto itself, as were all of the original five „towns“ of Prague (Old Town, New Town, Mala Strana, Prague Castle and the Jewish Quarter). In fact, the oldest remnants found in the city of Prague were found here. St. Vitus Cathedral - Peter Parler, who also designed the Charles Bridge, designed the oldest part of this cathedral in the 14th century. The striking height and beauty of the nave of this church are a testament to Parler's genius. Belvedere (Royal Summer Palace) - This royal residence is a rare example of Renaissance architecture in Prague. Its roof resembles the hull of a ship, and its location offers great views of the city below. 8. St. Nicholas in Mala Strana - High Baroque probably understates the look of this 18th-century Jesuit church designed the father and son architects Kristoff and Kilian Dientzenhoffer. It was meant to make a statement during the Counter-reformation, and it did! 9. Waldstein (Wallenstein) Gardens - These sumptuous gardens built by Count Wallenstein take luxury to a new dimension. Stroll through the statues by Adrien de Vries (these are copies - the Swedes ran off with the originals in the Thirty Years' War) with other visitors and a few resident peacocks. 10. Jewish Cemetary - Moving doesn't begin to describe the experience of walking through the jumbled and crowded ancient tombstones marking twelve layers of graves in what was once a walled ghetto.